This tutorial explains how to automatically mute all sites in Firefox browser. This will simply disable or block audio for any type of website (social networking, video streaming sites, some blog, etc.). Whenever you will open homepage or some other pages of any website, audio will remain disabled for all the webpages. You can also add websites to the whitelist so that those websites can play audio in Firefox browser. To do this, I’m using a free Firefox add-on here, which is named as “Mute sites by default“. Firefox also comes with a native feature to mute/unmute a tab, but that is reserved for that specific tab only. Also, the tab is unmuted automatically when you open it the next time. This add-on, on the other hand, completely blocks sound for an entire website. Even if you close and restart Firefox, websites will remain muted. The website will be able to play sound only if you whitelist it. 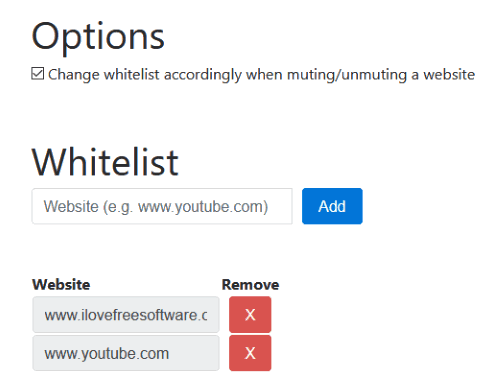 Also, you have the choice to automatically update the whitelist when you mute/unmute a website. Above you can see there is a mute icon displaying for all the websites or I say tabs. 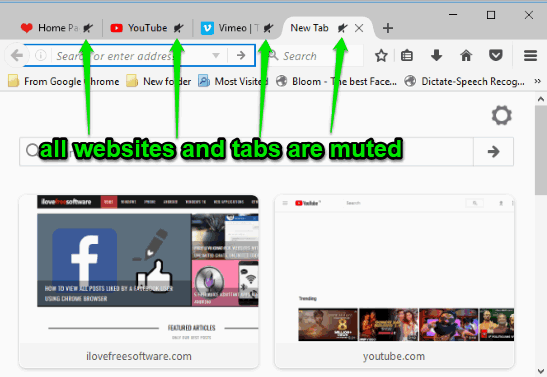 How To Automatically Mute All Sites In Firefox Browser Using This Free Add-on? Step 1: Use the homepage link of this add-on given at the end of this tutorial and install it. You don’t have to restart the browser after installation. Step 2: As soon as the add-on is installed, you will notice that all the websites (or tabs) are muted. The same will happen when you will open some more websites in other tabs. Step 3: To unmute a website or tab, you can click on volume icon visible on the tab. You can also use ‘Ctrl+M‘ hotkey or right-click on the volume icon visible in tab and select Unmute option. This will whitelist the website and unmute it. Step 4: You can also manually add/remove a website to whitelist it for playing the audio. To do this, you need to access Extensions page of Firefox, select More option available for this addon. Now, you can add a website to whitelist and remove any website from that list. You may also try How To Change Default Minimum and Maximum Zoom Levels In Firefox and How To Lock Tabs To Prevent Them From Closing In Firefox. This feature provided by this add-on to mute all websites at once in Firefox is simply good. It would have been better had this add-on come with a button or icon to toggle mute/unmute websites. Still, it is helpful as it gives the option to disable audio for all websites and then permit any website to play audio.